Sorry the sound is not very good. 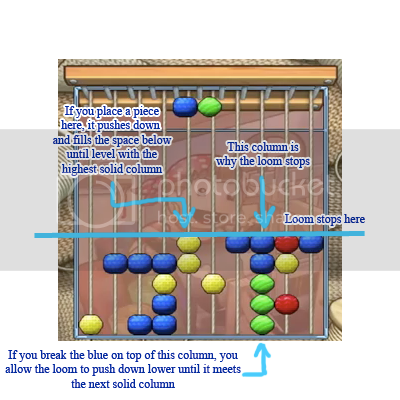 The loom initially wants to stop with the new drop on top of the black line because of column of five. 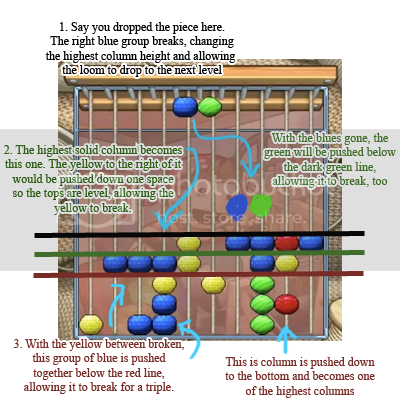 But because the highest columns keep clearing, the loom will push to the dark red line by the end of the combo. It stops there because the red/yellow/red becomes the highest column after everything else clears. The dark red line is where the R/Y/R column has been pushed to the bottom and can't go further, thus stopping the loom. Although, heh, even though I understand how it works, setting up effective combos are still somewhat of a crapshoot for me. Try to stick to one high column toward the middle. 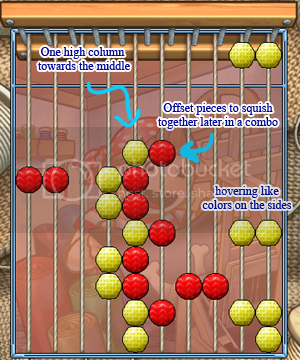 Use it to hover/float similar colored pieces over each other on the sides to be pushed down later in a combo. And then I think of it sort of like sailing, where I'll hang pieces off the edge of a solid column to promote another step of a combo. Thanks Bis, glad this puzzle makes sense to someone!